The demand for liquefied natural gas (LNG) as maritime fuel has risen due to tightened emission limits. LNG’s carbon dioxide emissions are a quarter smaller than those of heavy oils and, what’s more, its combustion does not cause particulate emissions. Additionally, its price development has been steadier than that of light fuel oils or heavy oils. When liquefied, the volume of natural gas is only a sixth hundredth of its normal state, thus facilitating its transportation and storage. Mega LNG terminals are being built in Finland’s busiest ports that are also suitable for large tankers. The first such in Tornio and Pori. Although Vaasa is not in the race for mega terminals, this does not mean that the region is not in need of LNG. In the spring of 2015, Wärtsilä, EPV Energy Ltd, Vaasan Sähkö and the City of Vaasa together with the consulting firm Wega Advisors began to look into the conditions for the construction of a small multi-purpose terminal in Vaasa. In addition to maritime traffic, it would serve industries and transportation within a 150 km radius of the city. – We are in the process of mapping how many companies in the region would be interested in using LNG, if it was made available. At the same time, we will try to find the best way of constructing an affordable distribution network around the LNG terminal, tells Mr Niko Ristikankare, the Managing Director of Wega Advisors. The company specializes in energy projects, fuel management, environmental consulting and financial services, and it has also participated in the planning of Tornio’s ManGan LNG terminal. Mr Ristikankare, who gave a presentation at the workshop arranged by the project Midway Alignment of the Bothnian Corridor, told that a fixed pipe system for the bunkering of ships would be built from the LNG terminal to the port. The liquefied natural gas would be transported to other customers with specialized vehicles. The customers could then use custom-made containers as fuel tanks from which they could extract the exact amount of fuel needed. In addition to industrial use, LNG could be used for instance as additional fuel in greenhouses. It could also be used as the fuel of district heating networks in densely built-up areas such as business parks and industrial areas, which are outside the ordinary district heating network. The report is expected to be completed by the end of the year, and its results will determine the progress in the LNG terminal project. 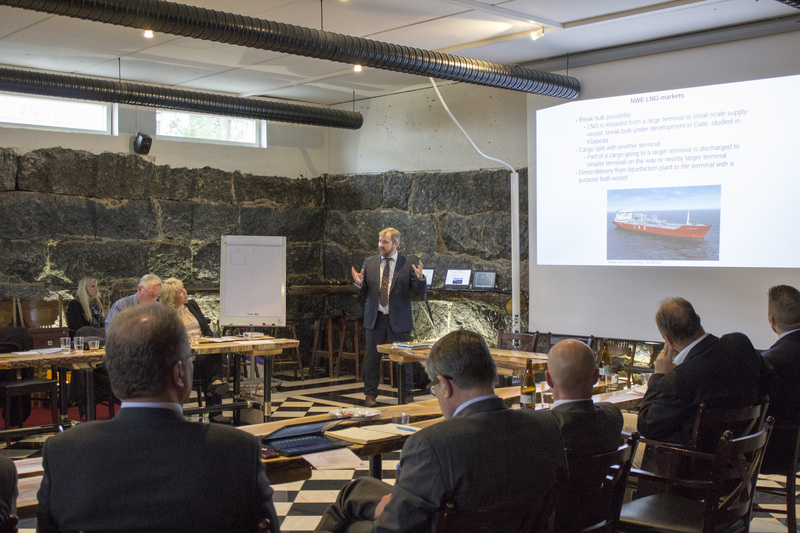 Mr Brian Simpson (European Coordinator for the Motorways of the Sea), who participated in the Midway Alignment workshop and concluded it, was very impressed with the LNG know-how of Finnish companies – and especially of companies in the Vaasa region. He believes that we will lead the way in LNG development and, in the future, share our know-how with the rest of Europe.